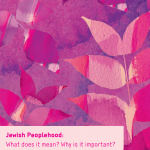 This collection of 16 essays on the topic of sustainability and its connection to Jewish Peoplehood is a partnership between the CJPE and Siach. With shmita as the framework, authors from different disciplines consider what sustainability means for the Jewish People in the 21st Century. Some take an activist stance and call on us to renew our commitments to renewable energy sources and debt forgiveness to relieve the lives of the most vulnerable amongst us. Others understand sustainability in more spiritual terms, an opportunity to reconnect with the adamah (land) and to remember that we are stewards not masters ofthe earth. Still others consider the ways in which a focus on environmental issues can be ‘common ground’ to rally around and unite the ever growing disconnect between Jewish communities in Israel and world Jewry. PreviousPrevious project:PEOPLEHOOD PAPERS IN HEBREW – מהדורה עברית של דפי העמיותNextNext project:Does Jewish Peoplehood Have a Future?